Opting out of Wednesday morning was fairly warranted – my blood-sugar was over 500 after soccer which I of course over treated and woke up 27. Those are about as bad as it gets on either sides. Of course drenched in sweat and 1/2 asleep I over treated again (yes, a reoccurrence) and woke up in the 300s …which meant no run. So my excuse for not making up for it Wednesday night? Despite mentioning that stress-management was my daily healthy effort I had a very (very) emotional day at work that left me drained and in bed at 9:30. Why yes, I did lose to the snooze button after going to bed ridiculously early. Anyways….I had the whole idontwannaaaaa thing going on but after having one too many handfuls of PB Cheerios I told myself I had to be out the door by 8:30. Luckily my sneakers still make me happy and lacing up was a little easier. When I used to run at night I ran in the East Village where I was always dodging people, running around the Upper East Side is not quite the same and I opted out of running along the river. RunKeeper was lying to me again, whispering in my ear that I was running 8 minute miles. 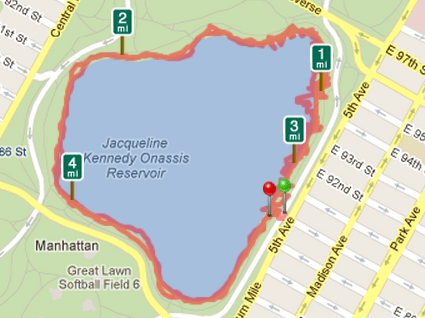 I remapped it when I got home and it was 3.75 miles with an average pace of 10:13. I’ll go with it, there were moments I felt like the entire run was uphill but had a really strong finish at the end. P.S. I love that in NYC I can finish a run, cool down for a block and stop into the grocery store not caring if I’m flushed/sweaty/seen. Freezer is still broken and I was starting to play roulette not icing my knee & groin so I stopped to pick up a bag…and peanut butter b/c 24 hours with out PB is too long. Categories: Uncategorized | Tags: Blood sugar, excuses, night run, nyc, quotes, RunKeeper, running, snooze button, work | Permalink.